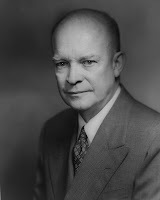 We start out the show with an authentic recording of the Uncle Warren's Attic show from Jan. 17, 1961, as President Dwight D. Eisenhower presents his farewell speech to the nation. It's a historic address, and it provides a lot of room for thought about what's happened in the past 46 years or so. Also on the show are a 1966 ad for the film "Lady L" from the Jean Shepherd show ... "Liar Liar" by singer-songwriter Julie Harris ... "Grow" by singer-songwriter April Start ... and "I'm Beginning to Remember" by Jimmy Lee and Johnny Mathis - no, not that Johnny Mathis. It comes with a promise to be back in a week - what am I thinking?!? Click the podcast icon or here to download - or just push "play" on the player to your right.